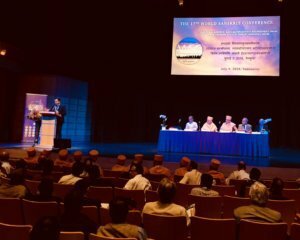 Vancouver (Canada) — The 17th World Sanskrit Conference, the premier international forum for Sanskrit scholars, recognized Bhagwan Swaminarayan’s Akshar-Purushottam Darshan as the first new independent school of Vedanta since the 16th century. 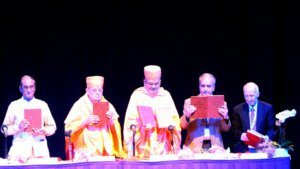 The recently authored ground-breaking Sanskrit works on the Akshar-Purushottam Darshan, the Swaminarayan Bhashyam and the Swaminarayan Siddhanta-Sudha by Sadhu Bhadreshdas of the BAPS Swaminarayan Sanstha, were also launched in the conference’s inaugural session on July 9, in Vancouver, Canada. 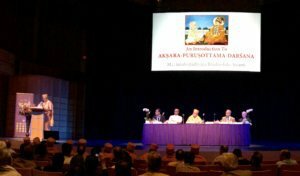 More than 600 eminent Sanskrit scholars and educators had gathered from over 40 countries for this historic event. 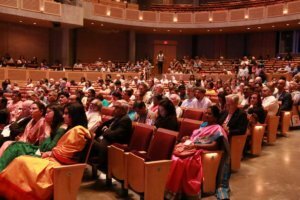 The triennial World Sanskrit Conference, which for the last half-century has been bringing the finest minds in the world of Sanskrit together to advance understanding of Sanskrit language and literature, was held for the first time in Canada, at the University of British Columbia in Vancouver. Mahamahopadhyaya Bhadreshdas Swami, an eminent Sanskrit scholar and ordained swami of the BAPS Swaminarayan Sanstha, completed the Swaminarayan Bhashyam, a five-volume comprehensive Sanskrit commentary on Hinduism’s three Vedic canonical texts (Prasthanatrayi) – the Upanishads, Bhagavad Gita and Brahma Sutras – in 2007. These three texts form the foundation for the philosophical beliefs of Hindu Vedanta (commentarial) traditions. 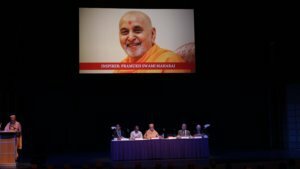 In 2017, Bhadreshdas Swami also completed the Swaminarayana-Siddhanta-Sudha, a classical Sanskrit dialectic treatise that offers an exposition, justification, and defense of the Akshar-Purushottam Darshan’s theological and philosophical principles.